New release: The Invaders. Invasion tales have been a convention of genre fiction ever since storytellers began to weave anxiety about dodgy neighbors into their narratives. And a historical heyday for such yarns was during Victorian and Edwardian times, when political intrigue and paranoia ran high. Creators returned to the theme again and again, perhaps most notably for Spy Vibers, during the boom in Red Scare science fiction films in the late 1950s and early 1960s. It was no surprise then to see Quinn Martin reintroduce the theme to audiences in 1967-1968 with The Invaders (pre-dating Gerry Anderson's UFO by three years). That point in the decade was beginning to be steeped in the counterculture, violence, protest, and unrest. Writers began to tap darker themes for shows like The Prisoner and Captain Scarlet and the Mysterons. In The Invaders, Roy Thinnes starred as David Vincent, an architect who goes on the lamb after discovering aliens have infiltrated our society. In a kind of hybrid of The Fugitive and Invasion of the Body Snatchers, each episode was a quest for Vincent to find allies and expose the baddies. Series creator Larry Cohen mentioned in commentary that the theme was intentionally trying to expose the paranoia seen in the States during the early Cold War and McCarthy era. But for classic TV fans, the series remains an old fave of 1960s sci-fi intrigue and fun. Look out for famous guest stars! It was also enough of a hit in many countries to warrant the licensing of books, comics, and other merchandise. Neat trivia: music from The Invaders was originally used in The Unknown, a 1964 story that was dual-filmed as a possible series but was aired as an episode ("The Forms of Things Unknown") of The Outer Limits, and starred David McCallum (The Man From U.N.C.L.E. ), Vera Miles (The Wrong Man, Psycho, One of Our Spies is Missing), and Sir Cedric Hardwicke (Invisible Agent). 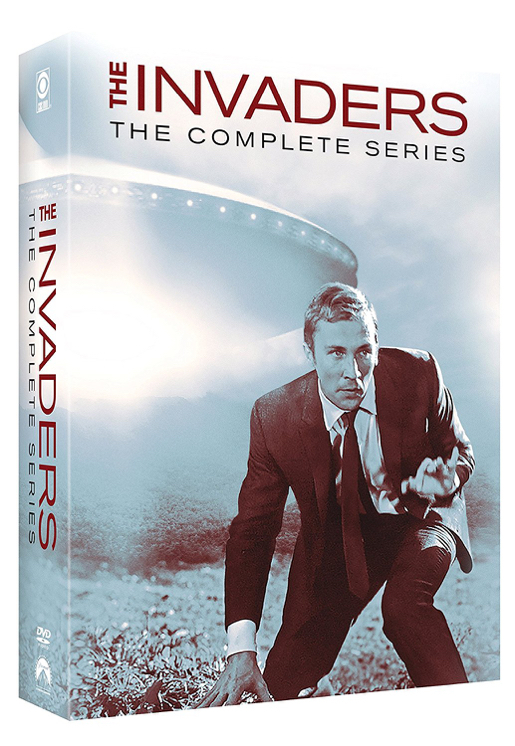 The Invaders has been brought back in print (after a 10-year gap) by Paramount, who has repackaged all the content from their original DVDs into a complete set. Check it out on Amazon. This will be great news for Spy Vibers who didn't purchase the 2008/9 editions and have been waiting for an affordable option. Enjoy! Selected Spy Vibe Posts: 007 Horowitz Book Tour, McGoohan/Prisoner Event at Elstree, The Prisoner Interviews Vol 1, British Underground Press, Interview: Fab4 Mania, Bond Cocktail Book, Bond at Bletchley, Spy Smasher, Spy Vibe Radio: Peter Gunn, Agent Zero M, New Prisoner Comic, Dr. No Villains Edition, Spy Vibe Radio: Danger Diabolik, Dr. No 60th, Oy-Oy-Seven, Spy Vibe Radio (UFO), Cold War Comic Strips, Thunderball Event, Mission to India, Mort Walker Celebration, Peter Wyngarde Celebration, Batman 66 Exhibit, Prisoner Fifty Event, Ian Fleming Publications 2017-2018, Interview: Ed Hulse Pulp, Avengers Audio Drama, Interview: Callan At 50, Interview: Playboys, Spies, Private Eyes, TWA Returns, Spy Vibe Radio 8, Interview: Ryan Heshka, Mid-Century Modern Schulz, Agent Werewolf, Mata Hair Exhibit, Johnny Sokko 50th, Interview: Trina Robbins, Eddie Izzard, The Prisoner Capt Scarlet 50th, Hugh Hefner R.I.P., Jack Good R.I.P., Interview: Shaken Not Stirred, Callan 50th, Spy Vibe Radio 7, The Prisoner 50th Event, Spy-Fi Event, Kaho Aso 007, Two Million, Bo Diddley, Carnaby Pop, Le Carre Events, Billy Bragg Skiffle, Elvis 68, Jack Kirby The Prisoner, Casino Royale Concert, Review: The Prisoner Vol 2, Interview: The Prisoner Essential Guide, Maud Russell Mottisfont, Spy Vibe Radio 4, Batman Gallants, Adam West R.I.P., Village Triangle, Roger Moore R.I.P., Spy Vibe Radio 3, Sgt Pepper 50th, Satanik Kriminal OST, 60s Overdrive, Make Love in London, Spy Vibe Radio 2, Spy Vibe Radio 1, James Bond Strips, Propaganda Mabuse, Interview: Police Surgeon, XTC Avengers, 1966 Pep Spies, Batman Book Interview, Exclusive Fleming Interview, Avengers Comic Strips, Robert Vaughn RIP, UNCLE Fashions, Thunderbirds Are Pop!, Interview: Spy Film Guide, Lost Avengers Found, The Callan File, Mission Impossible 50th, Green Hornet 50th, Star Trek 50th, Portmeirion Photography 1, Filming the Prisoner, Gaiman McGinnins Project, Ian Fleming Grave, Revolver at 50, Karen Romanko Interview, Mod Tales 2, Umbrella Man: Patrick Macnee, New Beatles Film, The Curious Camera, Esterel Fashion 1966, Exclusive Ian Ogilvy Interview, 007 Tribute Covers, The Phantom Avon novels return, Ian Fleming Festival, Argoman Design, Sylvia Anderson R.I.P., Ken Adam R.I.P., George Martin R.I.P., The New Avengers Comics, The Phantom at 80, 007 Manga, Avengerworld Book, Diana Rigg Auto Show, The Prisoner Audio Drama Review.